A traffic enforcer gestures at motorists to avoid a flooded street as Typhoon Mangkhut plows through northeastern Philippines before dawn on Saturday, Sept. 15, 2018, in Manila. An official says Typhoon Mangkhut has left at least 12 people dead in the northern Philippines, mostly in landslides. Tolentino says that at least two other people are missing and that the death toll could climb to 16 once other casualty reports are verified. He says about 87,000 people evacuated from high-risk areas and advised them not to return home until the lingering danger has passed. 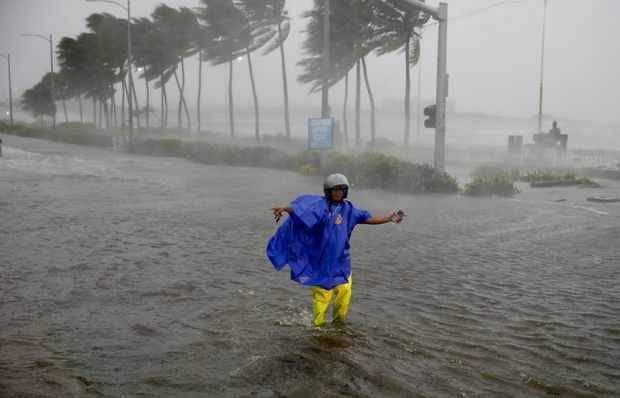 With a huge raincloud band 900 kilometres (560 miles) wide, combined with seasonal monsoon rains, the typhoon dumped intense rain that could set off landslides and flash floods. Storm warnings have been raised in almost all the provinces across the Luzon, including the capital, Manila, restricting sea and air travel. A few hours after landfall, the eye of the typhoon was nearing the western coast of Luzon facing the South China Sea. Mangkhut is on target to hit southern China on Sunday. Before it hit land, Mangkhut packed sustained winds of 205 kilometres (127 miles) per hour and gusts of up to 255 kph (158 mph), forecasters said. Even if the typhoon weakens slightly after slamming ashore, its winds will remain very destructive, government forecaster Rene Paciente said. 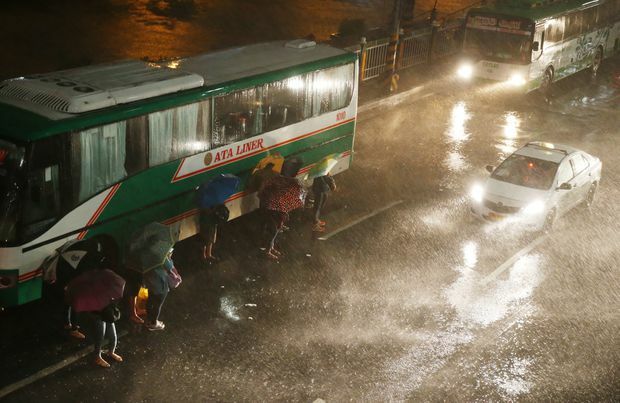 Commuters brave the rain and strong winds brought about by Typhoon Mangkhut before dawn on Saturday, Sept. 15, 2018, in Manila. In 2016, a super typhoon wrought heavy damage to Banez’s hotel and the rest of Cagayan.